hard-surfaced ramp; parking for 60 Vehicles. & toilets, boat rental, marina. 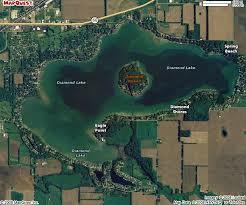 Diamond Lake is conveniently located in central Cass County. Its water quality, size and location make it a very popular lake for Illinois and Indiana vacationers and weekend residents. The demand for Diamond Lake property remains strong and considerable transistion is apparent. It is still possible to find fixer-upper and tear-down homes but be prepared to pay a premium as escalating land values reflect the scarce supply. Many newer properties are commanding 7 figure pricing and undeveloped sites are next to non-existent.